A new Kickstarter project has recently been launched for the Nipi Cooler, a cold store cooler with a twist. The Nipi Cooler has 47 litres of cooling space, which can fit up to 70 tins of your favorite beverage, but additionally it also has 1,000 lumens worth of interior and exterior LED lighting. Not only that but the Nipi Cooler also comes with its very own photovoltaic panels, although oddly these aren’t employed for chilling process. Instead the contents of the Nipi Cooler are maintained at low temperatures using a double-insulated cover and extra-thickness walls. The photovoltaic panels supply enough peak energy to power the LED lights as well as several digital gadgets, such as smartphones or stereo speakers. 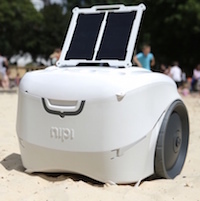 The solar panels can be positioned on the cooler’s external lid or installed adjacent to the Nipi Cooler. It is also possible to attach more panels to boost power output. Excess energy generated is stored in a 14,000 mAh lithium battery, with a 2nd battery available as an optional extra. There are 2 USB interfaces on the cooler’s exterior for charging gadgets and a further 2 ports within its dry lockable storage space designed for storage of valuables. A full battery can charge a cell phone seven times before becoming depleted itself, and it take no more than an hour to fill a cell phone when also using the solar panel. To top it all off, the Nipi Cooler also sports cup holders, cutting board and its extra-large wheels for off-road use. Looks like just what one needs for the next BBQ party!